CND Vinylux Weekly Top Coat / Gee Whiskers! It is always difficult finding a top coat that truly prolongs the life of your manicure. I have tried a fair share of them and have only found a few that truly work wonders. A few weeks ago I was sent a top coat a long with a few other nail products. 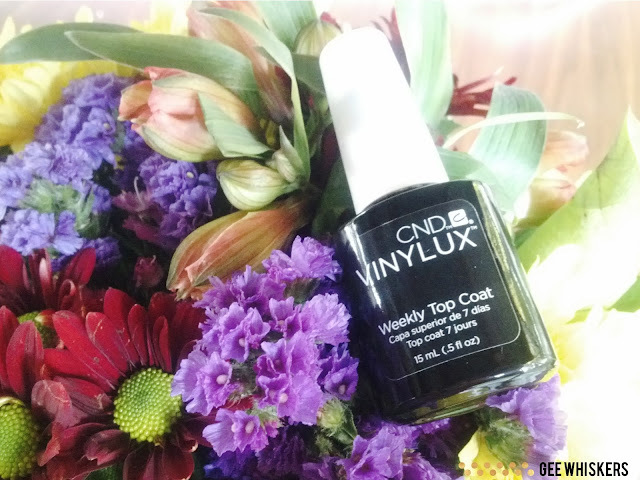 CND Vinylux Weekly Top Coat is meant to be worn with the CND Weekly Nail Polish range. When worn together it gives you 7 days chip free wear. I have used this with normal nail polishes and found that generally my manicure will last an extra day than usual. To me that is great because I do have a few colours that I love to wear but hardly do because they only last one or two days before chipping (and I have become really lazy when it comes to painting my nails recently). The thing that is the biggest winner for me is the very fast drying time. As I mentioned, I am very lazy lately with manicures so I want things that dry quickly and work well. Overall, I am impressed with this top coat and I find that I do reach for it when doing my nails. You can purchase CND Vinylux products products from Exclusive Beauty Solutions.